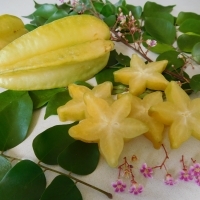 The carambola is appropriately nick named star fruit for it's five golden wings that reveal a star-shaped pattern when cut crosswise. The juicy transparent flesh has a citrus quality with a floral accent and is delicious eaten fresh, made into juice or into a delicious chutney. The tree makes an ideal specimen plant due to its attractive foliage and has the added bonus of producing large quantities of fruit. 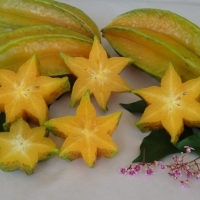 Carambolas are best grown in frost free subtropical climate. They can withstand light frost when established. They generally have two crops a year, one in summer and the second crop in winter. With pruning at different times of the year they can be induced to crop from summer to winter. 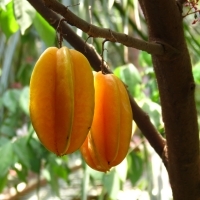 A very attractive fruiting tree, well worth having in the backyard. 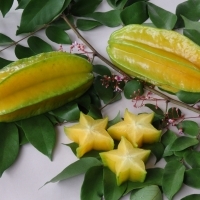 Cut into cross sections the fruits make attractive garnishes for sweet and savory dishes particularly seafood dishes. A relish can be made from unripe fruits by combining horseradish, celery, vinegar, seasonings and spices. Popular commercial variety, very heavy cropper of uniform very sweet juicy firm flesh with few seeds. 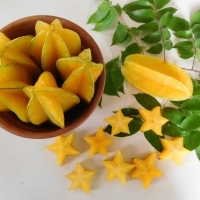 Fruit 100mm in length with small wings and bright yellow skin. 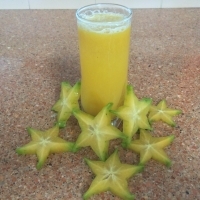 Carambolas are also called Star Fruit and are excellent fresh or juiced.